Caffeine is an amazing drug. Interestingly, I’ve never actually written about my extensive use of caffeine before, although it is a large part of who I am. As all my friends can attest, I’m an enormous caffeine junkie. I’ve been told by numerous people (my wife included) that I need to lay off the caffeine and take it easy–or I’ll end up dead. Growing up, I never drank much caffeine–except small amounts in soda. I could never stand the taste of coffee (although this is beginning to change–I still don’t see myself ever drinking coffee on a daily basis). My first real experience with caffeine was during my schooling at the University of California, Santa Cruz, which is where I tried my first energy drink. One of my roommates routinely drank these, and eventually I came around to trying them (they were awesome, by the way). After that, it was pretty much game over. Energy drinks tasted awesome, and made me feel amazing. 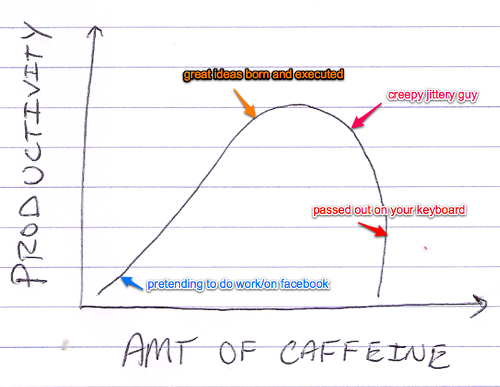 Through years of experimentation, I’ve come to realize how much caffeine has changed me as a person. The normal Randall is a pretty awful guy. He procrastinates, is easily distracted, and is typically negative by nature. When I’m not caffeinated, I feel like a completely different person. The first thing I’ve noticed about my un-caffeinated self is that I tend to over think things, and not in a good way. I won’t go as far as saying I’m paranoid, but I over analyze even the smallest situations and make them into big issues. When I’m un-caffeinated, I tend to argue a lot more frequently with my wife about stupid things, like who replaced the trash and who did the dishes. This over analysis also carries over into other parts of my life, including my work and health. When un-caffeinated, I tend to feel overly stressed out by the business of startup life, and let this stress bleed over into my exercise and eating habits, which rapidly degrade. The biggest problem with this is that I’ll focus all my energy, effort, stress and worry on a single item, and let all my other responsibilities, goals and commitments suffocate. It probably doesn’t help that I tend to be an obsessive person by nature, and have problems focusing on multiple things at a time. Without caffeine, this side of me seems to run amuck. When un-caffeinated, I also feel overwhelmingly negative. Instead of looking at life in a positive, enthusiastic way–I tend to view even the most fun experiences as chores (horrible, I know). Although I really do love writing code on my free time, when I’m not on caffeine I have an extremely hard time making myself do it, even though I want to, as it just seems like a pointless chore. This isn’t always the case–but overall, I tend to be far more negative when I’m un-caffeinated. When I’m on caffeine–I feel amazing. I’ve never done any hard drugs before, but I can’t imagine that they’d make me feel any better than caffeine does. When I’m on caffeine, I feel like a monster. I feel powerful, calm, smart, enthusiastic, energetic, positive, and unconquerable. Nothing can get me down. The most obvious effect caffeine has on me is my mental state. Within 20 minutes of taking 100+ mg of caffeine, I begin to feel calm (this is the opposite effect that most people tend to have, or so I’ve been told). It is a good sort of calm–a samurai calm, if you will. I feel as if I have the power to do what I want to do, whenever I please. I feel confident, insightful, and peaceful. After the calm sets in, I notice that my thoughts become clearer and more precise. Instead of feeling pulled in numerous directions by things I want (and need) to do: work, exercise, eat, work on projects, etc.–I feel an overwhelming sense of self-direction. I’m able to pick what is most important to me at the moment, and put all my effort and focus into this task, which gives me an amazing sense of self of fulfilment. The greatest part about this clarity in my mind is that it puts me into “the zone”, and after finishing one thing, my momentum builds, and the snowball effect takes over. The physical effects caffeine has on me are also amazing. When caffeinated, I have unlimited physical energy. In fact, of all my workouts in the past few years, the best ones were done in a caffeinated state. When I workout with caffeine, I’m able to push myself much harder and for longer periods of time than I can otherwise. Caffeine also keeps me satiated. The more caffeine I take, the less hungry I feel–and this feeling lasts for hours at a time. 200mg of caffeine and I won’t be hungry (at all) for ~4 hours. This has been particularly useful to me as it helps me avoid consuming unnecessary calories throughout the day in the form of snacks. Lastly, being caffeinated makes me feel happy. I truly feel like I’m the person I was “meant to be” when I’m taking caffeine. As awful as this sounds, I really feel like I’m at my best, and my happiest, when I’m caffeinated. I’m able to enjoy each moment of life as I pass through it, which puts me at peace internally. It is actually rather hard for me to write about this, as I can’t help but feel somewhat embarrassed at my caffeine usage–but here it goes anyway. NOTE: Don’t do what I do. It’s probably extremely risky and unhealthy, and I know that I need to change my habits significantly. I cycle caffeine. I’ve read tons of articles on the drug, and realize that my cycling isn’t as effective as it could be (in large part because I don’t go off it long enough to really flush it completely out of my system), but it has been effective for me. Keep in mind that the amounts of caffeine listed below are less effective at higher weights. I’m a fairly big guy (~220lbs), so these amounts would likely be really dangerous for someone smaller. My general cycle is three weeks on caffeine, one week off. After years of messing around with caffeine in various quantities and cycles, this has been the most effective for me. By effective I mean that it allows me to feel good for the maximum amount of time, without having the burnout that comes with too much caffeine usage over a sustained period of time (I’ll get into that later). In any given month, I’ll typically go the first week of the month un-caffeinated. Considering the amounts of caffeine I take the rest of the month, and the amount of time required to fully flush caffeine from one’s system, the week that I do spend un-caffeinated is actually still pretty good for me. The remaining caffeine in my system keeps me feeling pretty good through the week, even though I’m not taking it. This week is especially important in the cycle because without it, I’ll begin feeling groggy, and burnt-out. I’ve found that one week is just enough time to let my body catch up with me, and it allows me to get the most consistent effect from caffeine over long periods of time. The other three weeks of the month are variable. I’ll take anywhere from 100mg to 2g (max) of caffeine per day, fluctuating its usage as necessary. I try to gradually increase my usage–for example: week 2 (of a month) I’ll take between 100mg and 400mg of caffeine. Week 3 I’ll take between 400mg and 600mg. Week 4 I’ll take anywhere from 100mg to 2g. NOTE: Days when I take more than 1g of caffeine are always followed by days with very low dosages of caffeine–100mg or 200mg, as I’m afraid I’ll overdo it. Zero Carb Rockstar Energy Drinks (they taste like fruit punch, have only 10 calories, and 240mg of caffeine per can). The NoDoz pills are great because they’re pure caffeine–no other stuff mixed in, so you know that you’re doing it is as pure a way as possible. The Zero Carb Rockstars are great because they have great flavor, almost no calories, no carbs (no sugar), and are nice to sip on while you’re working. The Rockstars allow you to spread your caffeine intake out a bit more, instead of ingesting it all at once. There have been a few times when I’ve overdone it on the caffeine. When this happens, I’ll feel it the following morning when I wake up. The feeling is awful. I feel dehydrated, groggy, sick, and slow. The only thing that helps is to sit down in a quiet, dark place, and drink lots of water. This has happened only a few times, but each time has been a horrible experience. What led me to originally cycle my caffeine usage was that after 3 weeks of taking caffeine, I would begin to feel groggy, sick and dehydrated every morning. It wouldn’t be as severe as it was when I knew I took to much in a single day–but it would be enough to negatively effect me. The week off of caffeine at the beginning of each month allows me to reap the benefits of extended caffeine usage everyday, without any bad days. I realize that I need to bring my caffeine usage down a lot. While I don’t consider caffeine to be bad in any way, I do realize that taking it in high doses, frequently, can lead to lots of bad health effects. For the sake of myself, my wife, and my dog, I’ve specifically begun reducing my caffeine usage during my 3 week cycle. I’m currently try to take no more than 500mg per day, maximum–which is a far leap from my prior usage. So far, my reduced caffeine usage has been going pretty well. I still feel awesome, so I’ll continue to keep it up. I hope that one day, both my normal (un-caffeinated) and caffeinated self can be the same person. I’ve got a lot of work to do.